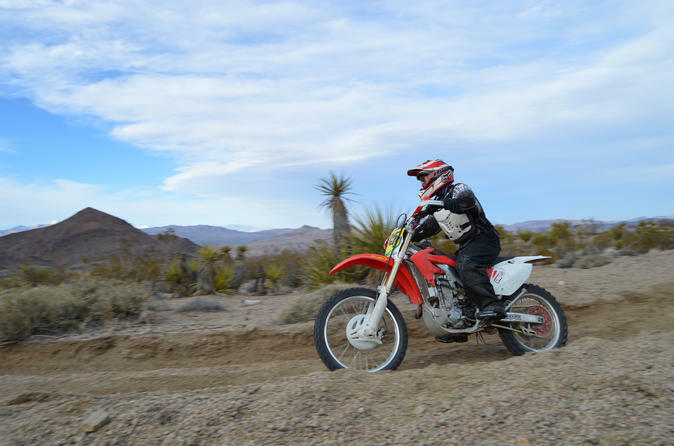 Get off the pavement and take this extreme dirt bike tour, to Hidden Valley and Primm, you'll take a challenging but exhilarating ride through rugged desert and mountain terrain. Your trip to the Nevada Desert begins with a complimentary air-conditioned ride from Las Vegas to Jean, Nevada approximately 20-30 minutes drive dependent on traffic. After a short but thorough safety briefing, you'll set out on a thrilling off-road adventure through the Hidden Valley National Monument, McCullough Mountain Range and across the Roach Dry Lake. Experience a variety of single-track and dual-track trails. This tour will also take you to some more challenging trails, mountain overlooks and legendary off-road racetracks. This extreme dirt bike tour will cover anywhere from 20 to more than 50 miles of rugged desert terrain depending on group size and riding abilities. Your tour will include a short break at Buffalo Bill's Hotel and Casino in Primm, Nevada on the California - Nevada Stateline and then prepare for your return dirt bike ride. This tour is challenging so you must have prior dirt bike riding experience before taking this dirt bike adventure. Please note: All riders must be at least 16 years old. Special Offer - Book by October 31, 2018 and save 12% compared to the local supplier's price for travel through December 2018! - Book Now!